Domestic Longhairs have long, fluffy fur. They come in every color seen in cats, as well as every pattern, including tabby, patched tabby and solid. Domestic Longhairs are not purebred cats, but are of mixed ancestry. Domestic Longhairs need weekly brushing to remove loose hair and to discourage mats and hairballs. Domestic Longhairs can vary greatly in temperament because of their mixed breeding. 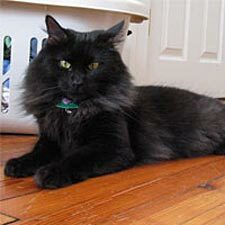 The Domestic Longhair is the result of many generations of mixed breeding with different types of cats. In the U.S., cats first came on the Mayflower with the Pilgrims. Some of these cats went on to be the foundation for pure breeds like the American Shorthair, while others bred to cats brought to America from foreign countries. Domestic Longhairs are closely related to Domestic Shorthairs. The primary difference is the recessive long-coat gene inherited by the Domestic Longhair, which produces its fluffy coat. A Domestic Shorthair can produce a Domestic Longhair, and vice versa.